Horse breeders are interested in how traits will be transmitted to offspring. The basic rules of inheritance are the same for all genes. Every horse gets a complete genome from both the sire and the dam. While the rules of inheritance are the same for all genes, the way that genes determine traits is different for different traits. Any given trait has an attribute called heritability. This is an indication of the extent to which genetics determines the trait. In humans, the language that you speak is not heritable. If a baby from China grows up in France, the baby will speak French, not Chinese. Language is a trait that is entirely dependent on environment. At the other extreme, some traits are entirely determined by genetics, often by single genes. In horses, genes affecting coat color are of this type, and coat color is said to have a very high heritability. Many traits of importance to horse breeders are complex traits, affected by multiple genetic and environmental factors. Performance and conformation are both affected by a number of genes, many with small effects. Performance is also strongly affected by environment (training). Gregor Mendel, a Moravian friar working with pea plants, worked out the basic rules of inheritance in the 19th century. He picked traits that were highly heritable. Single genes determined all of the traits, and hybrids between two true-breeding lines always exactly resembled one parent. The different forms of the genes that he worked with are called different alleles. In hybrids, one of the alleles (the one determining the trait that was seen) was called dominant, while the other allele (the one determining the trait that would reappear in subsequent generations) was called recessive. Mendel showed that during sexual reproduction, each parent contributed one of its two alleles to each gamete. Union of gametes during fertilization is random, so it is possible to predict the frequency of different types of offspring using simple rules of probability. Possible outcomes from the breeding of a Frame Overo (n/O) stallion and a non-Overo (n/n) mare. 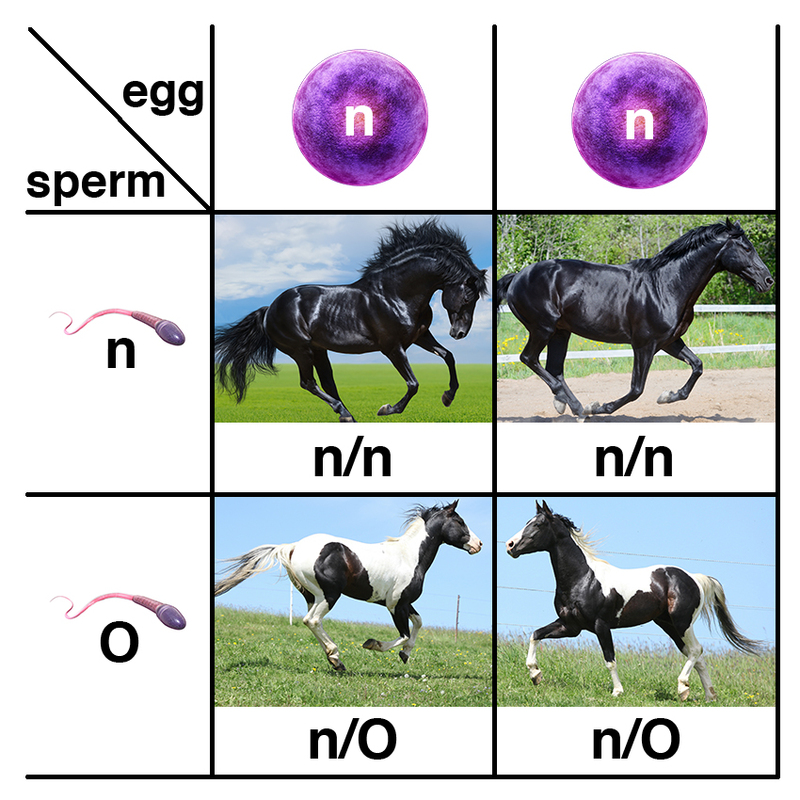 The stallion will produce two different kinds of sperm (n or O), but both of the mare's alleles are the same, so there will be only one kind of egg (n). Mendel's rules of inheritance apply to traits of this kind in horses. For example, there is a highly desirable white pattern gene called Frame Overo. The white markings of the Frame Overo horse are a dominant trait, so horses carrying one variant allele and one normal allele will show white markings. When a Frame Overo horse is bred to a horse without white markings, a foal has a 50% chance of inheriting the Frame Overo allele and having white markings, and a 50% chance of inheriting the normal allele and not having white markings. Possible outcomes from the breeding of a Frame Overo (n/O) stallion and a Frame Overo (n/O) mare. The stallion will produce two different kinds of sperm (n or O) and the mare will produce two different kinds of eggs (n or O). The Frame Overo allele is also associated with a recessive trait, Lethal white syndrome. If two Frame Overo horses, both with one variant and one normal allele (n/O), are bred, each has a 50% chance of producing a gamete with the Frame Overo allele and a 50% chance of producing a gamete with the normal allele. Because union of gametes is random, there is a 25% chance that a foal will get two normal alleles (n/n) and will not have white markings, a 50% chance that a foal will get one Frame Overo allele and one normal allele (n/O) and will have Frame Overo markings, and a 25% chance that a foal will get two Frame Overo alleles (O/O). Horses with two Frame Overo alleles are entirely white and show Lethal white syndrome. They will die within a few days of birth. In this case, Lethal white syndrome is a recessive trait associated with the Frame Overo allele. Some inherited diseases in horses result from dominant alleles. Hyperkalemic periodic paralysis (HYPP) is an inherited disorder that results in muscle tremors or paralysis. The muscle tremor trait is semidominant, with horses that have two copies of the variant more severely affected than those with one variant allele and one normal allele. 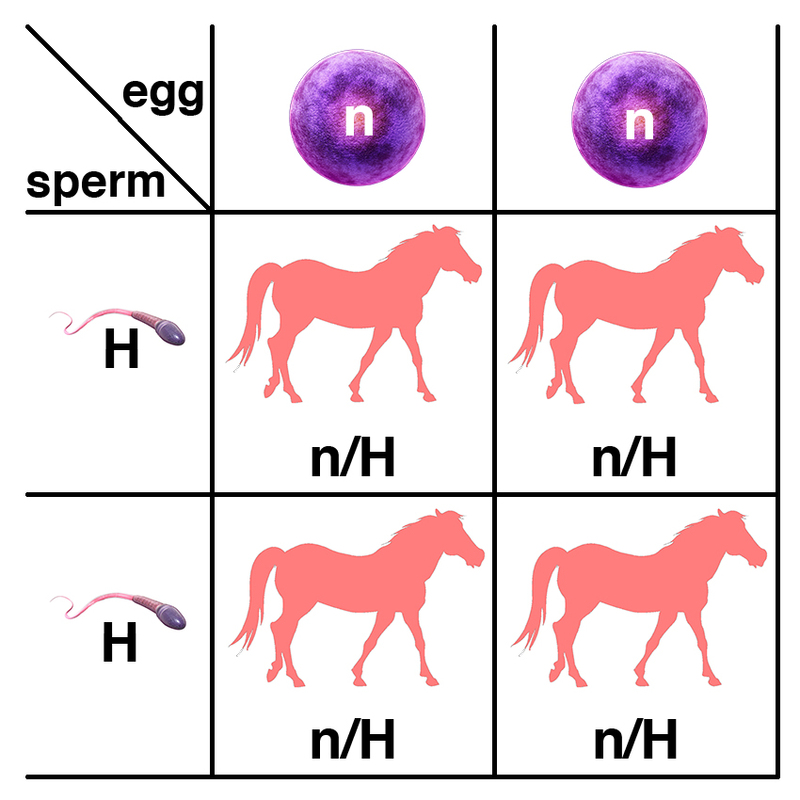 Possible outcomes from the breeding of a stallion homozygous for the variant that causes HYPP (H/H) and a normal (n/n) mare. 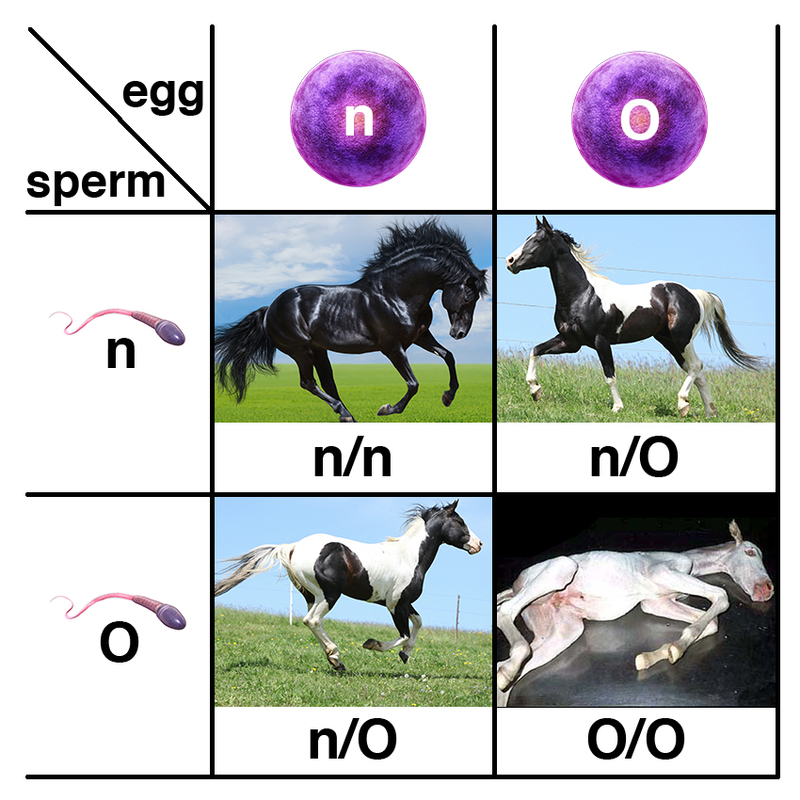 The stallion will produce only one kind of sperm (H), while the mare will produce only one kind of egg (n). If a horse with two copies of the variant allele (H/H) is bred to a normal (n/n) horse, a foal has a 100% chance of having one variant and one normal allele (n/H). 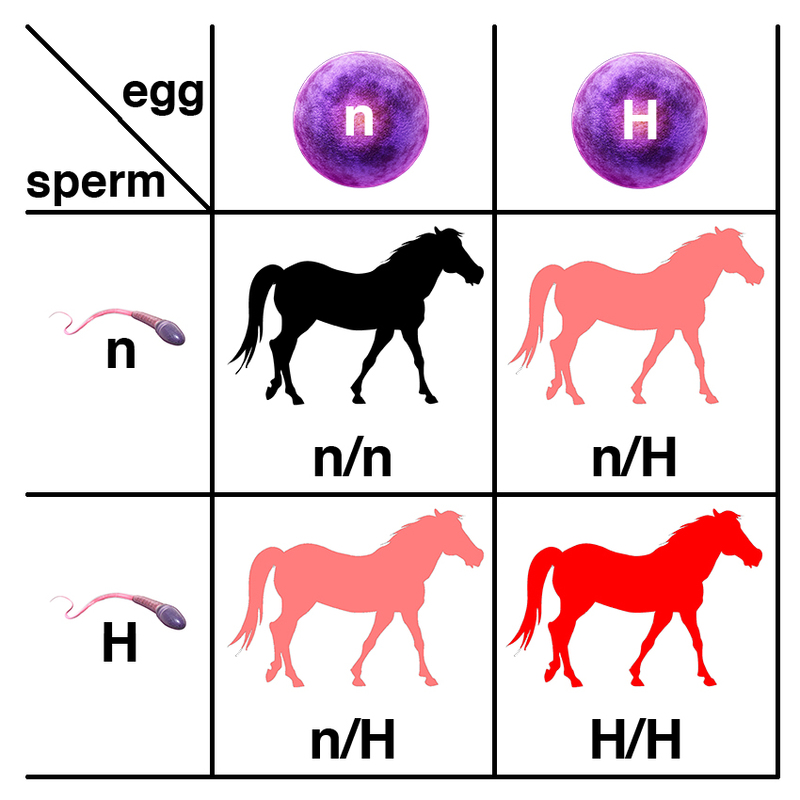 Possible outcomes from the breeding of a stallion heterozyogus for the variant that causes HYPP (n/H) and a normal (n/n) mare. 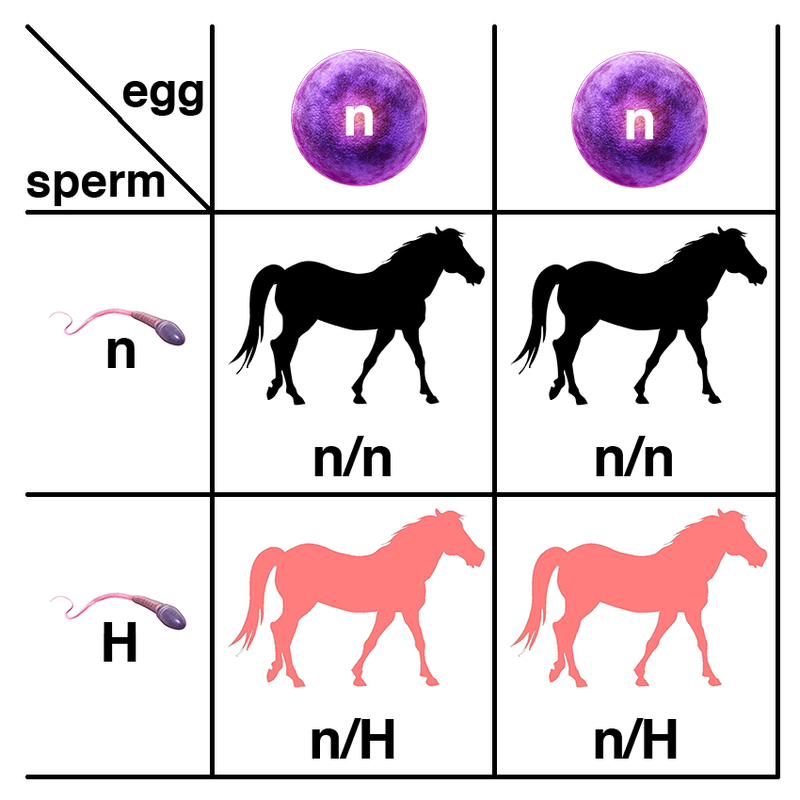 The stallion will produce two kinds of sperm (n or H), while the mare will produce only one kind of egg (n). If a horse with one copy of the variant (n/H) is bred to a normal (n/n) horse, a foal has a 50% chance of having one variant and one normal allele (n/H) and a 50% chance of having two normal alleles (n/n). Possible outcomes from the breeding of a stallion and a mare both heterozyogus for the variant that causes HYPP (n/H). The stallion will produce two kinds of sperm (n or H), and the mare will produce two kinds of egg (n or H). If two horses with one copy of the variant (n/H) are bred, a foal has a 25% chance of having two copies of the variant (H/H), a 50% chance of having one copy of the variant (n/H), and a 25% chance of having two normal alleles (n/n).